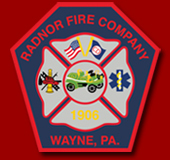 The Radnor Fire Company will serve as a Primary Election Day polling location for Radnor Township, Delaware County Ward 3 Precinct 1. The polls will be open from 7 a.m. - 8 p.m. on Tuesday, May 15, 2018. Voters are directed to enter the firehouse via the side door of the station parking lot. Voting will take place in the 2nd floor meeting room. There is an elevator available in the 1st floor lobby area for those who are unable to utilize the stairs. Voters and poll workers are directed to park at the Radnor Middle School Parking Lot, South Wayne Avenue Municipal Parking Lot, or at the Wayne Post Office. Please DO NOT attempt to park in the firehouse parking lot or in front of the apparatus bays.